1. Make the gingerbread syrup by combining the water, sugar, ginger, cinnamon, and vanilla in a medium saucepan. Be sure the pan is not too small or the mixture could easily bubble over. 2. Bring the mixture to a boil, then reduce the heat and simmer the syrup uncovered for 15 minutes. Remove the syrup from the heat when it’s done and slap a lid on it. 3. Make a double shot of espresso(1/2 cup) using an espresso machine. Use the machine to steam 8 ounces of milk, or heat up the milk in the microwave if your machine does not foam and steam milk. 5. 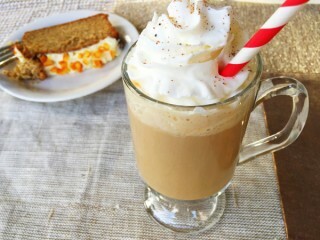 Top off the drink with a dollop of whipped cream and a sprinkle of nutmeg. Makes 1 grande latte (16 ounces).